I demoed This is Not a Test at Adepticon in 2017 and picked up the book and a few models. I haven’t had a chance to play it since, but that didn’t stop me from buying one more model. 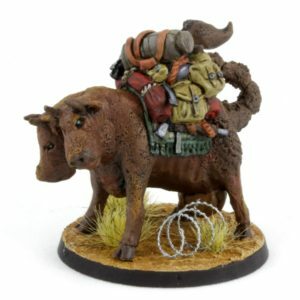 Why the caravan cow? Well, it amuses me. Plus, at least on some level, it could be a pack animal in other games, too. I used the Secret Weapon rust colors for the body, with orange tints on the skin and brown in the chitin. Now only do I like these colors for organics, it seems like rusty flesh would go along with the rest of the decrepit terrain. Much like the Overladen Henchman, the baggage provides a fun opportunity to pick out a lot of details. Plus, who doesn’t want a scorpion tail to defend their loot?